Here at Chemist Creative coffee can be considered one of the most useful tools to truly get our brains into human mode. So, naturally we would be in absolute love with crazy gadgets that allow coffee to be a part of life no matter where it takes us. We are excited to share this new tool, the Cafflano Klassic portable coffee grinder/brewer/cup, and some of the neat features it possesses. In all reality, what is not to love about this contraption? 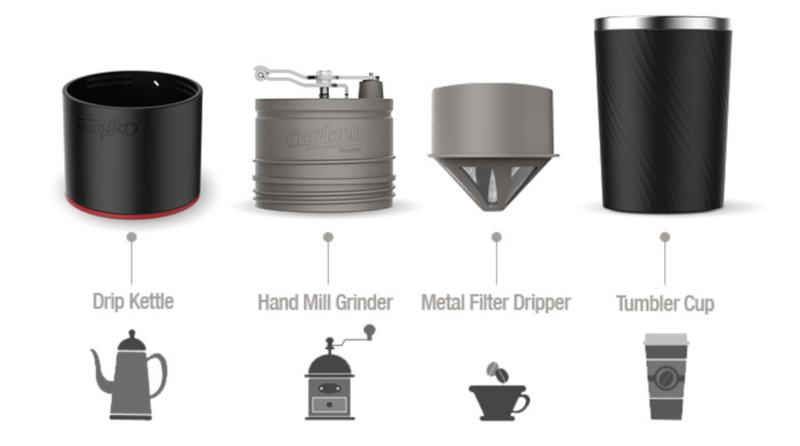 The Cafflano will grind your coffee and filter said coffee. It has a vessel to hold hot water to pour over that coffee. And it has another vessel that catches all of this beautiful black gold we keep rambling on about. You could brew coffee in your car. Or in your office. Or at the park while watching your kids get crunk on the monkey bars. All in all, it’s a portable coffee shop that fits in your carry on. All that you have left to do at this point is buy a jet boil (another product we could steal more of your time with). Now, you’re prepared to get out into some Pacific Northwestern scenic view and make your instagram feed really shine! What other fun gadgets have you come across that allow your caffeination dream to stay alive? Chase Record is a writer, a musician and a fantastic barista. He is married to his sweet wife Justina and baby Record is due in July.